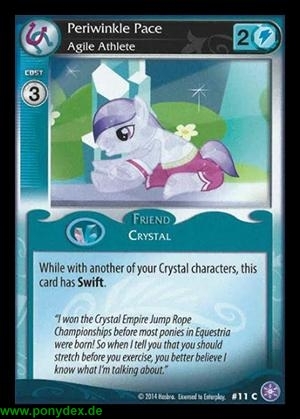 While with another of your Crystal characters, this card has Swift (You may move this card for 1 fewer action tokens.). "I won the Crystal Empire Jump Rope Championships before most ponies in Equestria were born! So when I tell you that you should strech before you exercise, you better believe I know what I'm talking about."